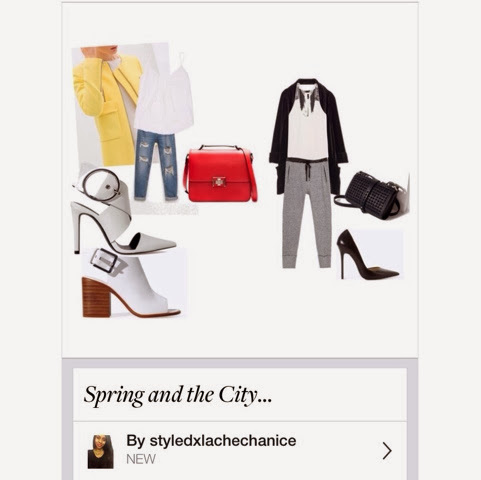 Here are two of my favourite spring looks which are perfect for any on the go fashion lover! These looks connote a juxtaposition between savvy and simple. Take any boyfriend or loose fit pair of denim (with or without distressing! ), a simple tank or tee, paired with a bright hued jacket or blazer. To sharpen the look, you can accessorize with your favourite structured bag and standout pumps or even a flat! A pointy vamp flat would do either of these looks justice! The same rules apply to the new trend of skinny sweats! I love this idea, particularly because I never wear sweats, this is a fun way to look killer and still include a ton of comfort. Pair any skinny leg sweats, a loose tank, and a blazer on top with some killer pumps and a statement or mini bag and you've got yourself a great on the go look, without all the effort! Any questions or comments feel free to drop a line below! Thank you always!